***Reflects Aston Martin, Ferrari and Lotus sales estimates. U.S. light-vehicle sales dropped 1 percent in January, with higher fleet shipments offsetting lower retail volume, as the government shutdown and severe cold that blasted the Midwest this week dampened consumer demand. The seasonally adjusted, annualized rate of sales for January came in at 16.9 million, down from 17.22 million in January 2018 and December’s 17.72 million rate, and marked the first month the pace of sales has dropped below 17 million since August. Cars remain a weak spot across the industry, falling 4 percent last month, while light-truck deliveries rose just 0.3 percent. January is typically one of the lowest months of the year for industry sales, with the least bearing on the year’s final results. Still, solid economic growth, employment gains, low gasoline prices and available credit continue to support light-vehicle demand, analysts said, even as consumers face higher financing costs. Ford, Honda and FCA US chalked up sales increases during the month while Toyota and Nissan tumbled as the industry felt the impact of the U.S. government shutdown and record-breaking cold on its first monthly scorecard of the year. FCA US posted a 2.5 percent rise, aided by big boosts in incentive spending and fleet shipments. Light-truck sales lifted American Honda 1.5 percent, while Ford Motor Co. ended a four-month sales skid with a 7.1 percent increase. Sales at Toyota Motor North America, meanwhile, dropped for the eighth time in the last 10 months, down 6.6 percent. And Nissan Group slid 19 percent amid an ongoing effort to cut back on fleet sales. January proved an early challenge for an industry that, according to most forecasts, is expected to fall short of 17 million annual sales for the first time since 2014. And those forecasts came before the 35-day U.S. government shutdown left 800,000 federal workers without paychecks, and record-setting cold kept millions of Americans bundled up at home during the last week of the month. "In spite of some frigid January weather, we remain bullish on 2019 given the continued underlying strength of the U.S. economy," Reid Bigland, head of U.S. sales operations for FCA, said in a statement. FCA’s increase marked its 11th straight gain in year-over-year monthly sales. Deliveries rose 24 percent at Ram, behind a 19 percent surge in pickup sales, but slipped 2.2 percent at Jeep. FCA said the severe cold wave in the Midwest and Northeast -- key regions for Jeep -- dampened demand late in the month, though volume still came close to 60,000 units. Sales fell 15 percent at the Chrysler brand, 1.9 percent at Dodge, 39 percent at Fiat and 30 percent at Alfa Romeo. At Toyota, volume fell 7.1 percent at the Toyota division and 2.8 percent at Lexus. Car sales dropped 5.5 percent while truck deliveries, a Toyota bright spot for months, declined 7.3 percent. At Nissan, which has been dialing back on fleet business, car sales dropped 25 percent and light-truck volume fell 13 percent drop. Overall, sales were down 20 percent at the Nissan division and 3.1 percent at Infiniti, even as the company's incentives last month edged up over January 2018’s. American Honda, behind record January light-truck deliveries, saw volume edge up 0.8 percent at the Honda brand and 9.6 percent at Acura. American Honda said its light-truck sales rose 4.3 percent, while car demand slipped 1.7 percent. Even with the extreme winter weather, Henio Arcangeli Jr., senior vice president of Honda's automobile division, said the company's January results signal there is "real consumer demand beyond trucks and SUVs." Sales of new crossovers also helped drive volume higher at Hyundai, up 2.9 percent, and Kia, up 4.9 percent. Subaru extended its streak of year over year monthly gains to 86 with a 3.9 percent increase in January sales. Volume dropped 6.7 percent at the Volkswagen brand and 20 percent at Mazda but rose 2.7 percent at Mitsubishi. Among other luxury brands, volume dropped 14 percent at Mercedes-Benz, 4.8 percent at BMW, 1.8 percent at Audi and 24 percent at Genesis but jumped 13 percent at Porsche, 5.2 percent at Volvo, 18 percent at Jaguar and 15 percent at Land Rover. Average incentive spending per new light vehicle was tracking at $3,720 in the first few weeks of January, down from $3,856 during the same period last year, J.D. Power said, adding it would be the seventh straight month of lower discounts. ALG estimated that the average incentive slipped 0.9 percent from a year ago to $3,642 last month, and 3.1 percent from December, with the Detroit 3 and Nissan among the biggest spenders. January incentive outlays for U.S. There were 25 selling days last month, the same as January 2018. Pickups, SUVs, crossovers and other light trucks accounted for 69.6% of new-vehicle retail sales through Jan. 20, the highest level ever for a January, J.D. Power said. Car sales are forecast to continue dropping in January, Cox Automotive estimates, with midsize cars down 4.2 percent and compact cars off 1.7 percent. The average transaction price for new light vehicles was $34,274 last month, up 1.9 percent from January 2018, while incentives as a percentage of average transaction prices fell 2.8 percent, ALG estimates. Because of fewer 0 percent financing deals, the average annual percentage rate on financed new vehicles hit 6.19 percent in January, the second-highest point in 10 years, Edmunds says. That compares to 4.99 percent in January 2018 and 4.22 percent five years ago. 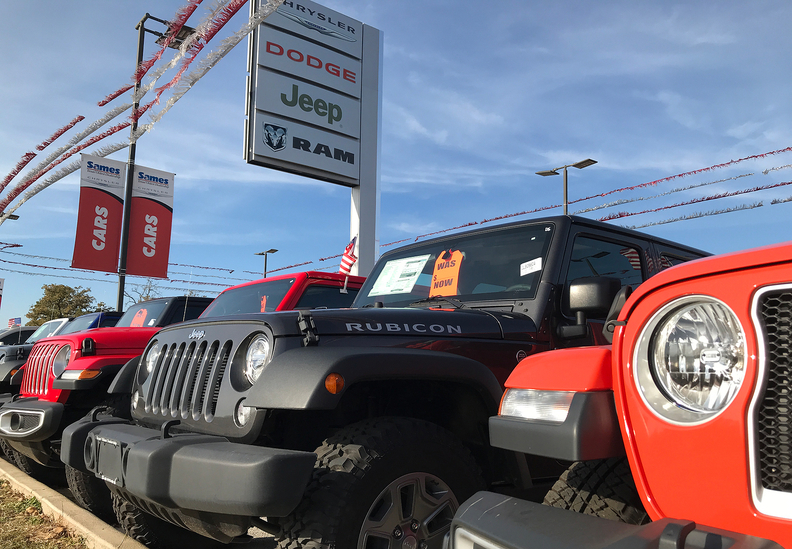 Days to turn, the average number of days a new vehicle sits on a dealer lot before being sold to a retail customer, was 71 days through Jan. 20, unchanged from January 2018, J.D. Power said. Fleet shipments are expected to total 277,100 cars and light trucks in January, up 3.4 percent from January 2018, J.D. Power estimates. Fleet volume is expected to account for 24 percent of total light-vehicle sales, up from 23 percent last year. "Car share continues to decline sharply, although the drop has slowed for some OEMs, so we may be approaching the bottom. Record cold weather during the last week of January likely had a negative impact on sales. However, it was not just the weather. We also believe the government shutdown had an impact, from delayed purchases by furloughed workers to a more general feeling of uncertainty in the market. Consumer confidence took a hit in January, with both the University of Michigan and Conference Board’s metrics showing large declines. Lower optimism reduces the number of potential vehicle buyers, a trend we are likely to see more of in 2019." "Consumer demand remains robust in January 2019, with positive economic indicators offsetting concerns over the government shutdown and market uncertainty." -- Thomas King, senior vice president of data and analytics at J.D. Power.